The project is due to be finished this weekend. A MURAL ADVOCATING ‘help not harm’ of Ireland’s drug users is currently being finished on a building in Trinity College. The piece, from renowned artist Joe Caslin, is currently being completed near the front square of Trinity. The theme of the piece is about a new Bill currently before the Oireachtas which wants to treat drug addicts medically and not have them put into our prison systems. 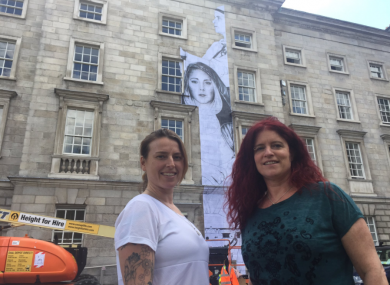 The installation, called Volunteers, is being backed by Senator Lynn Ruane and Senator Aodhán Ó Ríordáin who believe that a health-led approach that recognises the complexity of drug use is a better way forward rather than the current system. Joe Caslin’s artwork rose to prominence when he painted a picture of two men embracing on the wall of a building at the bottom of Geroge’s Street prior to the gay marriage referendum. He has done similar works in Galway and Edinburgh. Email “Renowned artist Joe Caslin is transforming Trinity's front square to advocate for kinder drug laws”. Feedback on “Renowned artist Joe Caslin is transforming Trinity's front square to advocate for kinder drug laws”.